Sasha's baby has been named Flynn. Flynn is now at the stage where he is starting to take food from hand. 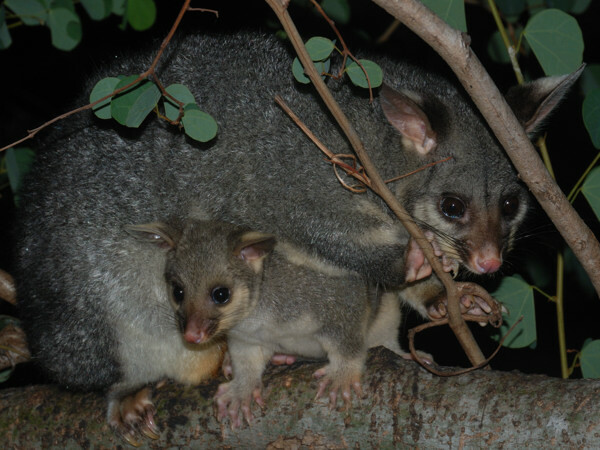 It's probably a bit early to tell, but so far, he strikes me as a comparatively calm and cautious possum and not as fierce or as adventurous as some of Kiki's babies have been. Of course, this is speaking relatively; he still vigorously tears food out of his mother's mouth and doesn't shy away from face-scrabbling. Ruby turned up one night with two little back-riders. She stayed at a safe distance but hung around for a while to show off her babies. Wasabi, who is probably the father, turned up the following day, after not having been seen for a while. Possibly he was wanting claim credit for his babies, but often he's seen around when there's a female in the area with babies, and it's likely he's watching over them. One night, the fur of Wasabi's back looked a bit messed up, like a mother possum's when a baby has been back-riding. It wouldn't surprise me if he occasionally takes his babies back-riding. Farley is sleeping in the possum boxes every day, but no longer visits the house as often as before, whereas Toto is now visiting regularly. These two might be related: Farley sometimes used to bully Toto, but Toto seems to be getting more confident and so maybe she's turned the tables on him. The male brush-turkey hasn't been seen for quite a while now. A female turkey has been seen around - or at least it looks like a female, but it's possible it's the male and his wattle has shrunk because it's no longer mating season. But the male is probably visiting at least occasionally because it seems that someone is still maintaining the mounds. No new turkey chicks have been spotted, but one partially grown youngster is seen around occasionally. 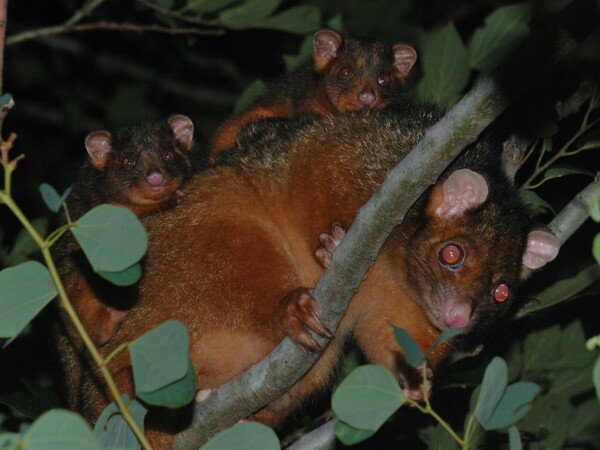 We know we've said this before, but we are so jealous of your ringtails! Absolutely beautiful... I love checking in on these beautiful animals. 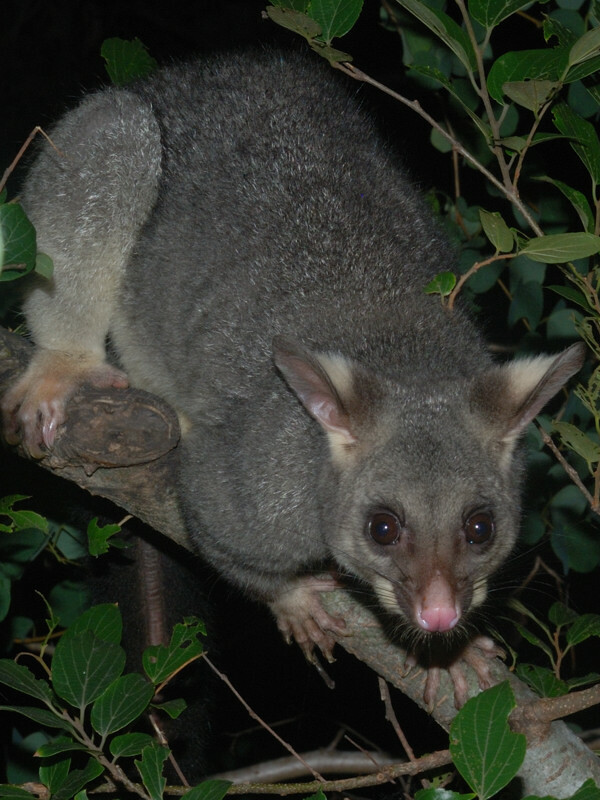 I wish I could have a set up of cameras in all my boxes and dreys, in one large drey I made I have a ringtail family of five & three brushtail possums in other boxes scattered over my property. 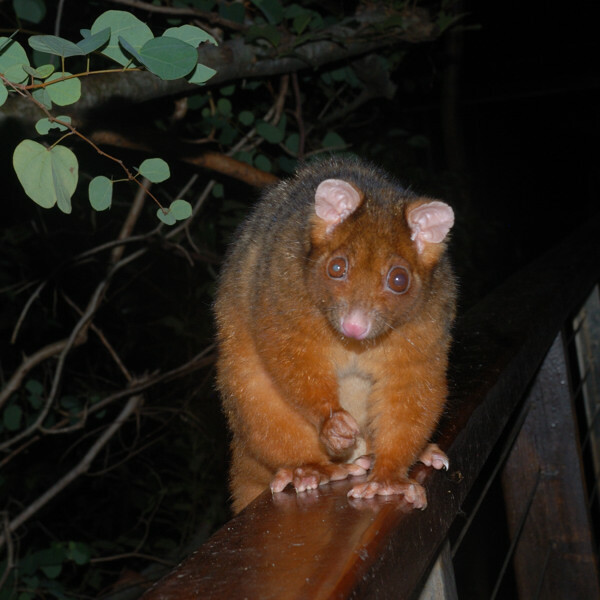 I hope this website encourages more people to see just how lovely all our wildlife are and the need for our help in our backyards can help them flourish, what an amazing Australia it would be if we all took time to care for these rightful owners. I tell everyone about this website! I'd love to see your ringtail family. That would be so cute to see five little ringtails huddled together. 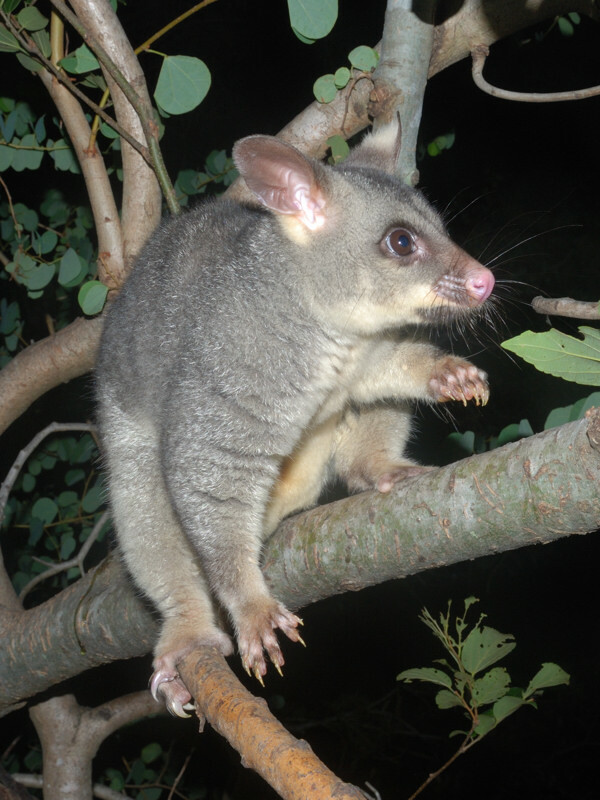 Recently, I've been looking to see if there's a way to put together some sort of self-contained box camera system that other people could install in their possum (or other wildlife) boxes. The system I use has analogue cameras that are wired back to a server computer. This has some advantages, but has two major problems; cabling from the cameras to the server is a massive pain (and also expensive if you have to go more than a short distance), and the server computer is a major exercise to build because there's no standard hardware or software you can buy to do the job. 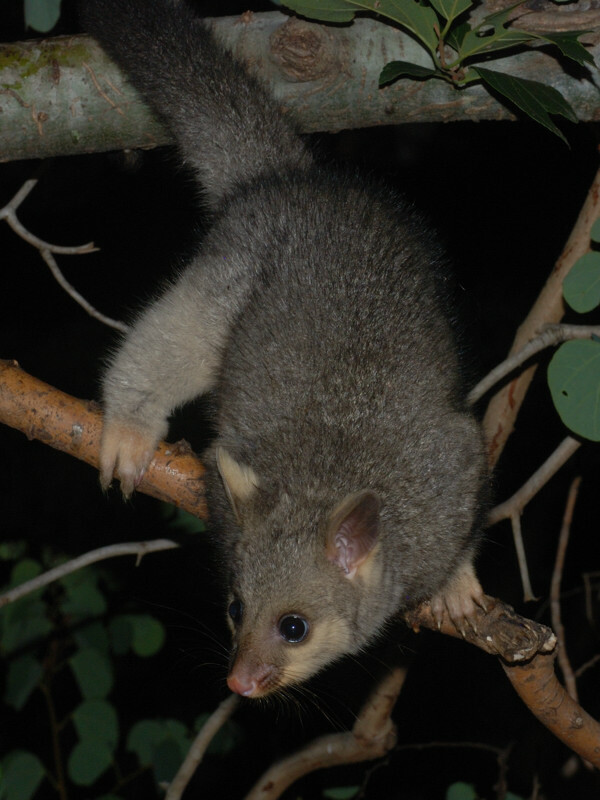 There are all sorts of video camera systems on the market - security cameras, baby monitors and so on - but I haven't been able to find any that are really suitable for use in possum boxes. They're either too expensive, or too limited in what they can do, and none can be used without modifications. What is needed is a camera system with a small solar panel and a Wifi link, that a person can simply buy and attach to a nest-box, without any need for running cables or setting up server computers etc. You would look at the boxes by simply using a web browser over your Wifi network. Putting the camera on the Internet would be a little more work, but most home routers have all of the required abilities built-in. 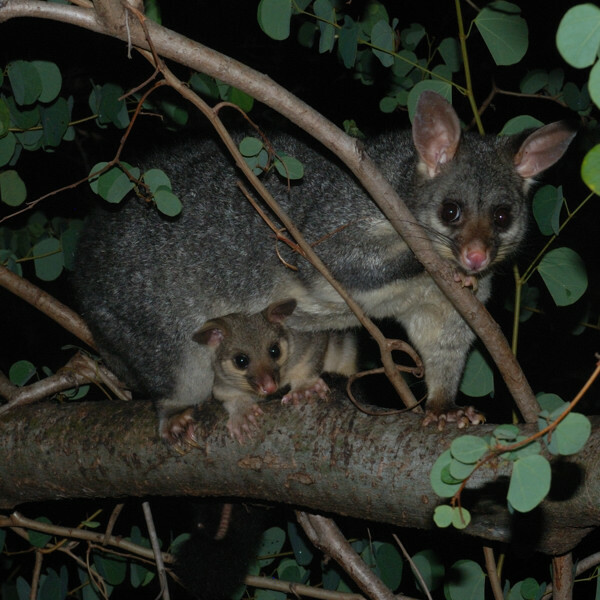 Given the technology available these days, such a system should be able to be produced relatively cheaply - which is an important consideration because most people won't want to spend hundreds of dollars on a possum camera. The problems I'm having are all a matter of detail; you need a specialised camera lens to work close-up in a nest box under infra-red light (my existing ones are far from optimal, but most others are even worse), the electronics need to be very power-efficient to run off a small solar panel + battery system, however the controller needs to have a fairly powerful processor to handle streaming video, and more powerful processors consume more power and are more expensive as well. You even have to be concerned about the battery because if things go wrong (e.g. it gets overcharged) it could catch fire, which would be disastrous. These aren't fatal problems, but they make it difficult to put something together cheaply using readily available components. Nevertheless I have a couple of ideas, and I'll definitely be posting on this blog if I make any progress. I'm sooo not computer/technical savy, I hope one day it will be made easy to install cameras in boxes. I love this website & how clever the set up is, If ever I was to visit Queensland this would be no 1 first attraction to visit, 'if aloud'. I love my backyard & seldom leave it as there is so much landscaping to do to attract more wildlife in to stay. I must try and take some photos of the ringtail family. I made a couple of dreys as described in a book but those dreys are now full of large crickets who are all hiding in it during the day, so I turned a large plastic pot on its side then attached timber pailings at opening with a hole & branch that they hold onto when coming out, this sits in my garage up high, we have always had ringtail possums in our garage in awkward little spots so a couple of years ago I tested some ideas & this one has been a big hit with them, enough room for the whole family. The father lives not far from garage in a drey he made at the top of a tall kentia palm... He sometimes sleeps with the family after strong wind has blown his drey out of the palm. Then I can tell he has been busy building another in the same spot as the melalucas I planted are striped of there soft foliage and made into a drey mixed with dried kentia palm fronds, I planted these special trees just for the ringtail possums as its one of there favourite nesting materials to work with. Melaleuca armillaris - Bracelet honey-myrtle. I have one female brushtail possum in the garage temporarily as her box was invaded by honey bees, we had a local bee farmer carefully remove the box & all bees, took him four hours, the hive was only the size of a tennis ball but enough to keep our brushtail possum away, she has lived in that box up high in the brusbox tree for over three years & had all her babies there, so her box is going back up soon & sure she will be overjoyed by that.